The Ducks begin spring practice in less than two weeks. As I wrote previously, most of the attention will be on who replaces the greatest player in Oregon history, but the Ducks should be just fine at the quarterback position next season. The position group that needs to make the biggest strides this spring is the linebackers. Last year’s Oregon defense, under first year defensive coordinator Don Pellum, was inconsistent. The “bend don’t break” defense that Oregon runs was a bit too flimsy early in the season before stiffening down the stretch and then falling off a cliff in the national championship game. Oregon’s defense is always going to be at a structural disadvantage due to how many more plays it has to defend with Oregon’s fast-paced offense. Oregon ranked 113th out of 128 teams in time of possession in 2014. Oregon’s defense is on the field more and faces more plays than almost every other team in the nation. As a result, total yards surrendered is not an effective measure of Oregon’s defensive success. Yards per play and points allowed are much better indicators of Oregon’s defensive performance. Unfortunately, in 2014, Oregon struggled in both yards per play and points allowed relative to previous seasons. While Oregon ranked 7th in the nation in 2013 in yards allowed per play and 19th during the 2010 national championship game run, the Ducks were a middling 53rd this past year. Scoring defense also suffered in 2014. After ranking 20th in 2010 and 16th in 2013 the Ducks dropped to 29th in 2014. While Oregon had a national championship caliber offense in 2014, the defense lagged behind. 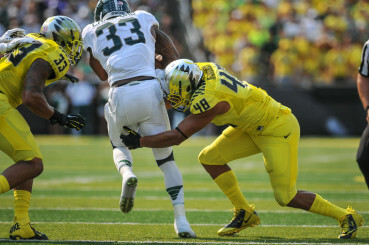 Oregon linebacker Rodney Hardrick makes a tackle against Michigan State. The Oregon defense was inconsistent last year, but it did come up huge in a number of big games. Oregon’s defense held Michigan State’s 7th-ranked offense to a season-low 27 points. It also turned in an absolutely dominating performance in the Pac-12 Championship game, holding the potent Arizona offense to 13 points. The defense also did a great job of surrendering only 20 points to Florida State in the Rose Bowl by opportunistically forcing the undisciplined FSU team into five turnovers. However, Florida State moved the ball a bit too easily against the Ducks, gaining 6.1 yards per play and 528 total yards. Fortunately for the Ducks, the defense’s inability to force Florida State to punt didn’t matter as the Ducks offense was almost unstoppable, gaining 7.9 yards a play and scoring seven touchdowns. Oregon’s defensive cracks that started to show against FSU were blown open in the National Championship Game with Ohio State gashing the Ducks for 6.4 yards per play and 42 points in a rout. Historically, the defensive line has been called out as the weakest link in Oregon’s defense. It has been maligned for being too small and soft. This past year, however, likely future top 15 NFL Draft pick Arik Armstead and All-Pac 12 performer DeForest Buckner anchored a strong defensive line that held its own throughout the 2014 season. Impressive goal line stands against Oregon State and Florida State were emblematic of this strong play. With five-star recruit Canton Kaumatule already on-campus and set to replace Armstead, and the return of seniors Buckner and Alex Balducci, the Ducks are well positioned to maintain strong play on the defensive line next year. Oregon’s linebackers, on the other hand, were plagued by missed tackles and general lack of playmaking ability. Pellum tried a myriad of combinations to find something that worked. This included bringing in Johnny Ragin and Derrick Malone for passing downs, but the linebackers never really found their stride. Outside of Joe Walker, honorable mention All Pac-12 this year, there weren’t too many highlights at the linebacker position. 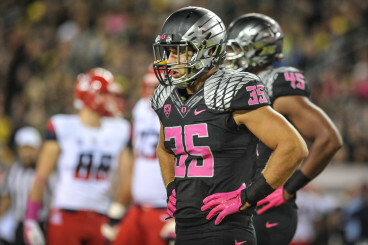 In the past five years, Oregon has been spoiled with playmakers at the linebacker position. Current NFL players Kiko Alonso, Casey Matthews, Josh Kaddu, Spencer Paysinger, and Eddie Pleasant (moved to safety), in addition to All Pac-12 performers Michael Clay and Dewitt Stuckey, anchored strong linebacker corps. The 2014 group had some talent like Derrick Malone, who received honorable mention all Pac-12 honors in 2013, and Joe Walker, honorable mention in 2014, but lacked the high-level talent of years past, and was easily the weakest defensive position group for the Ducks. Joe Walker will look to build on a solid 2014 season in 2015. This was especially evident on the biggest stage in the National Championship game. While Armstead turned in one of his best performances as a Duck with nine tackles, and his counterpart Buckner had eight, the linebackers were consistently out of position or overmatched. A 3-4 scheme, like the Ducks run, asks defensive linemen to take on blockers to free the linebackers to make plays. But while the defensive linemen were eating blockers and making tackles, the linebackers weren’t making many plays. Ohio State running back Ezekiel Elliot gained 172 yards before contact. If Buckner or Armstead didn’t tackle an Ohio State ball carrier at the line of scrimmage, he was often running untouched by the linebackers and into the secondary for massive chunks of yardage. To be fair to Oregon’s linebackers, they were in a tough spot in 2014. They had both a new linebackers coach and defensive coordinator in 2014. Coaching changes create growing pains. (See Oregon’s meltdown against Arizona during Head Coach Mark Helfrich’s first season.) Additionally, two very talented linebackers who were poised to contribute this past year, Oshay Dunmore and Tyrell Robinson, were dismissed from the team before the season started. With Oregon’s secondary replacing three senior All Pac-12 performers in Ifo Ekpre-Olomu, Troy Hill, and Erick Dargan, it is vital that the Oregon linebackers take a big step forward next season. Oregon should have all the experience it needs for the linebackers to step up with four seniors (Rodney Hardrick, Joe Walker, Tyson Coleman, and Christian French), a group that includes three players likely to start for the Ducks, again, this fall. Additionally, Pellum and Eric Chinander will be in their second years as defensive coordinator and linebackers coach, respectively. This experience provides reason for optimism in 2015. The key will be for those linebackers to make the most of their opportunities to improve technique and communication this spring and offseason, leading to an improved defense in 2015.